In my previous post, I displayed three Tejonero or Huehue masks by a master carver from the Sierra de Puebla—Benito Juárez Figueroa. Today I want to tell more about this carver and then I will show some of his later masks. 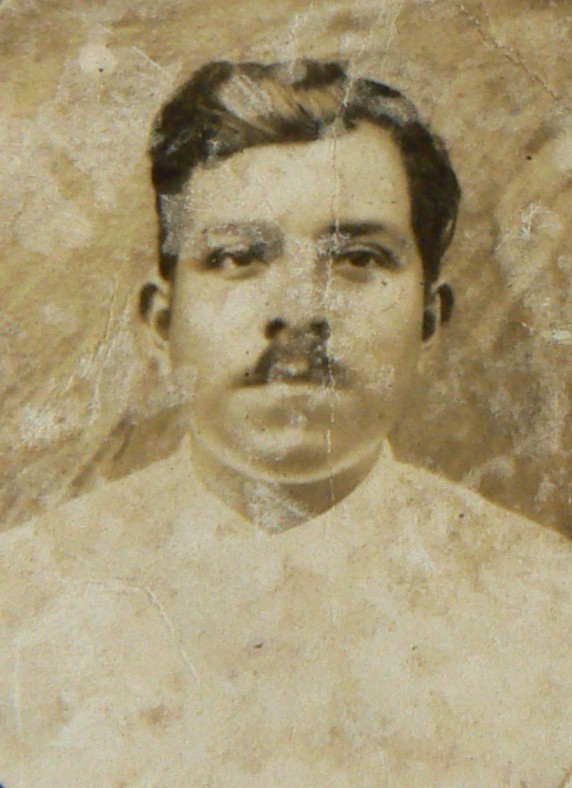 This is an old family photograph of Benito as a young man. This second photograph of Benito, although stained and damaged, is a rare image of this artist at work. He has carved a santo, a full-sized representation of a sacred figure, to be displayed in a Catholic church. In this case the santo represents Santo Entierro, Christ after his body has been removed from the cross and placed in the tomb, and before his resurrection. Benito is in the act of painting the sculpture. As in this instance, it is common for a mascarero (carver of masks) to also be a santero (carver of saints), and in later posts I will demonstrate masks that appear to have been modeled on the carved faces of saints. Welcome to Mexican Dance Masks—a website that is devoted to the presentation and discussion of authentic masks from Mexico, along with such related topics as the dances that these masks appear in, associated dance accessories, the carvers, the music, and useful books. My goal is to establish a database of masks and related objects, a discography, an annotated bibliography, and an atlas. I could simply present you with all this as an already constructed package, but I fear that many readers would find such a bundle of information indigestible. Instead I choose to build this collection of information, one post at a time, adding features as the accumulation of data warrents. I will frequently present material that illustrates the hand of a particular artist; often I will know that artist’s name, sometimes I will simply show a recognizable style. There may be occasions when a visitor will be able to supply the name or village of one of my anonymous favorites, and this will be much appreciated. A related goal is to serve as an area for the exhibition of good Mexican masks from other collections. You are invited to submit photos and descriptive comments of a mask or dance accessory in your collection, whether the item is well documented or of unknown provenance. You will notice that I make it a point to provide multiple views of an object, to better demonstrate its qualities, and I encourage you to do likewise. I am often surprised to see how much more interesting a mask is, in multiple views, in comparison to its appearance in a simple frontal photograph. In photos that follow, you will have the opportunity to see this for yourself. 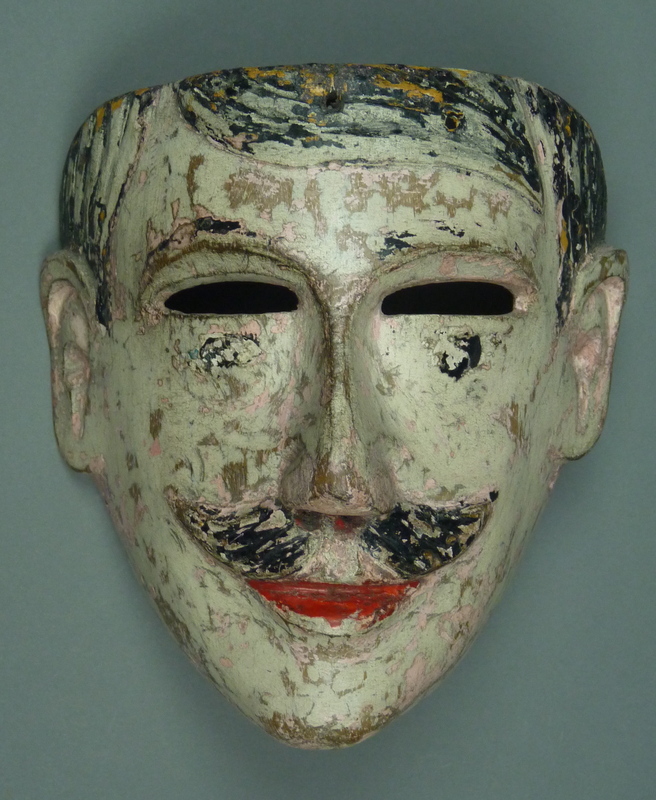 Although it is impractical for me to write about everything in my first post, I will just say briefly that this is not a site that is devoted to the artistic qualities of decorative masks. Instead, this site is meant to provide information about authentic dance masks, and one purpose of such information will be to assist you in differentiating between masks that were produced within a culture for ceremonial use versus other masks that have been invented, attributed to invented places, and falsely aged. The entire subject of decorative masks will be explored in depth in later posts (and see related discussion in FAQ). 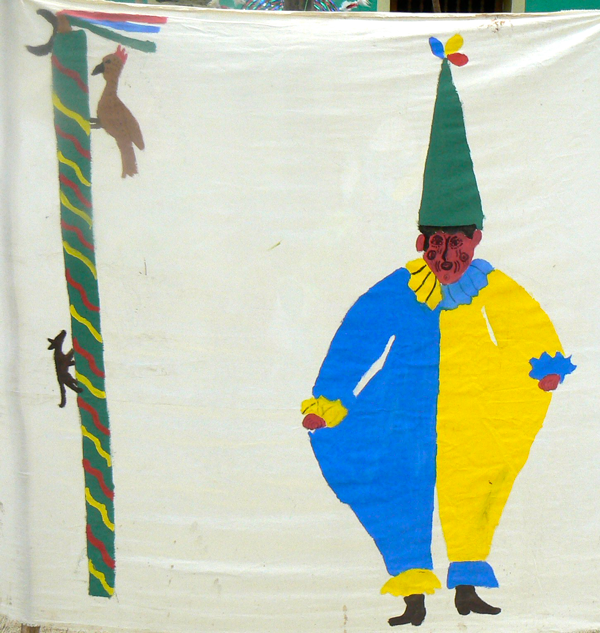 Among other things, this site is intended to introduce or re-introduce you to my first book about Mexican masks—Mexican Masks and Puppets: Master Carvers of the Sierra de Puebla. This was published by Schiffer Publishing in 2012. If you click on the cover image to the right, you can learn more about that book. There I discuss masks from an area of Mexico that can be called either the Sierra de Puebla or the Totonacapan. 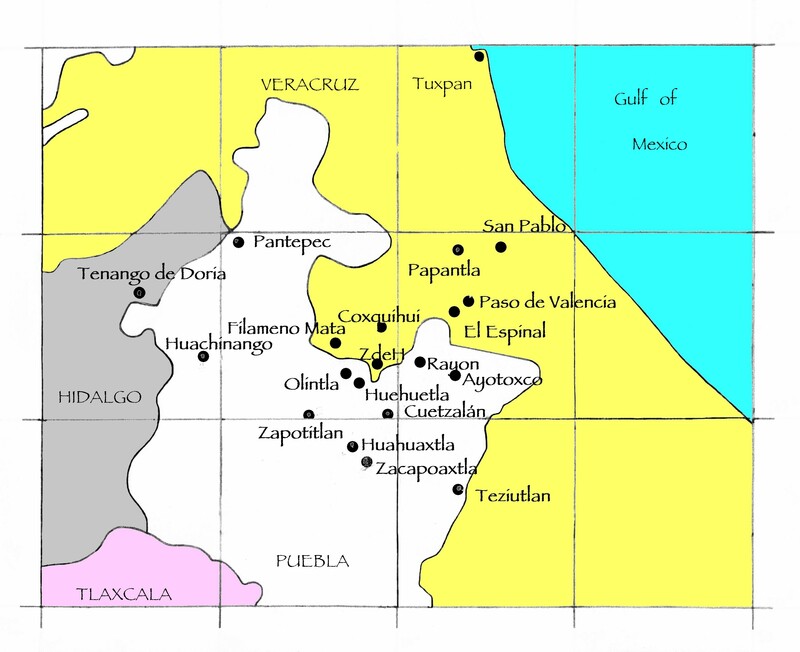 The latter is an example of Mexican regional names that refer to the former and sometimes persistent inhabitants of a region. In future posts I will introduce you to others, such as the Huasteca, the Mixteca, and the Tlapaneca. In the book I have provided more detailed explanations of some topics (with references) than will seem practical in these posts. On the other hand, the website format is ideally suited to the presentation of photos, compared to the physical limitations imposed by printed books. This is my map showing some of the towns in the Mexican states of Puebla and Veracruz where I found masks, dances, and carvers to include in the book. I am currently writing a second book about masks from Mexico, focusing on Yaqui Pascola masks. I will be sharing some information from that manuscript in future posts. 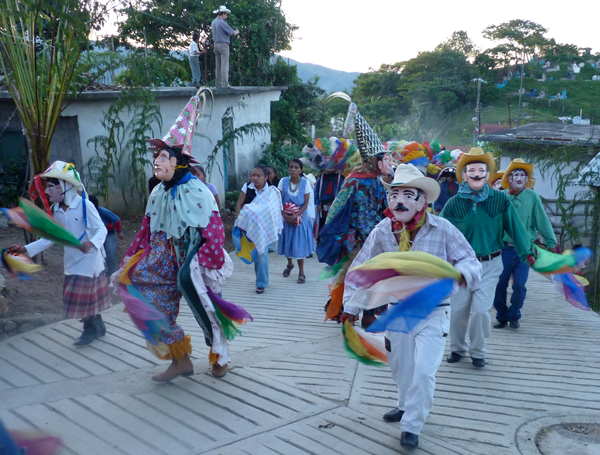 I am also gathering information for a third book, which will present Mixtec Masks from the Mexican state of Oaxaca, along with some masks from neighboring cultures. My co-author on that book will be Barbara Bruneau Cleaver. Such a blog has to begin somewhere. I will start with a pair of masks that reflect the early style of an identified master carver—Benito Juárez Figueroa—who lived in various villages in the Mexican states of Puebla and Veracruz. He grew up in Nanacatlán, Puebla, a town just south of Olintla and Huehuetla; in his latter years he lived in Fílameno Mata, across the border in the state of Veracruz. His masks are identifiable due to characteristic details of his carving style. 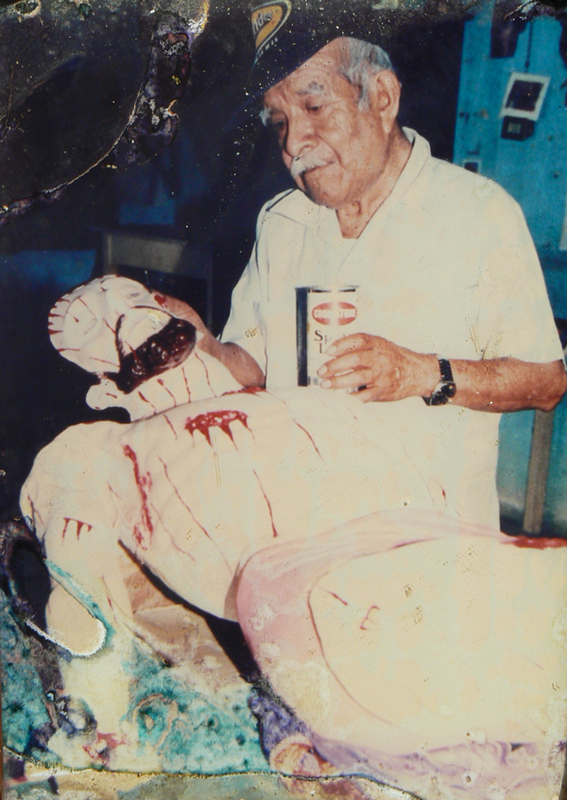 I had featured this carver and his masks in my book. First I will present a mask that I recently purchased on EBay™. When I first saw it, my attention was immediately drawn to the manner of carving of the ears. It is a strange and wonderful fact that masks with carved ears are the norm in the Sierra de Puebla, and that the mask carvers in this area each develop their own style for carving the ears. Therefore one can often reliably attribute a mask to a particular carver, based on the ear design. In this case, Benito apparently developed his own style as a young man, rather than copying the styles of his father and grandfather, who were established mask carvers. Later he adopted and improved upon his father’s style. Benito was born in 1910, he died in 1994, and I am supposing that the masks with his early ear design date to the first half of the 20th century. I have only seen a few of these masks, but I suspect that more of these will turn up, in museums, in private collections, and on the Internet.